I Engr A.A Sule, the APC Governorship flag bearer of our beloved State, wishes to rejoice and felicitate with you on this auspicious occasion of commemoration of the birthday of our Lord Jesus Christ, I wish you and your family peace, love and bounties of this Season. May the good Lord’s blessing, mercy and compassion be with us now and always, and grant us a hitch free general elections in 2019. On this note, I wish to solicit for your support and prayer for my Gubernatorial ambition in this festive period and beyond. I assure you of an all-inclusive governance devoid of tribal and religious sentiment, that will cater for our yearnings and aspirations, when voted as the next Governor of Nasarawa State, come 2019. 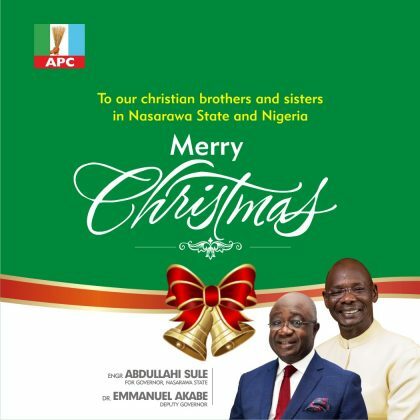 Happy Xmas once more, and a Prosperous New Year, I count on your support and prayers.